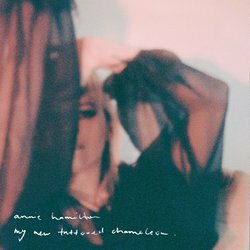 On her second single “My New Tattooed Chameleon” Sydney musician Annie Hamilton explores unfulfilled romance, nostalgia and self-discovery through propulsive, distorted guitars and cascading, melodic vocals. Following the release of her debut single “Fade” last year, the song is also a testament to Annie’s astute, direct storytelling and her ability to combine vulnerability with a versatile sound that oscillates between hushed contemplation and explosive, cinematic soundscapes. Annie also plays guitar in Jack River, and was formerly a founding member and lead guitarist in Sydney band Little May. Their brand of melodic, intricate indie-rock saw the group tour internationally, and release their critically acclaimed debut album ‘For The Company’, which was produced by The National’s Aaron Dessner. The first taste from Hamilton's solo maeterial arrived in June of last year, with the release of the stark and stirring song “Fade”. The song and accompanying video garnered praise from FBi Radio, Double J, RUSSH, LNWY and Triple J Unearthed, has accumulated over 60,000 streams and led to Australia-wide tours in support of Julia Jacklin, Jack River, Phantastic Ferniture and more.